A Crowdfunding initiative for Community Groups or people looking for start up Business or Project costs. 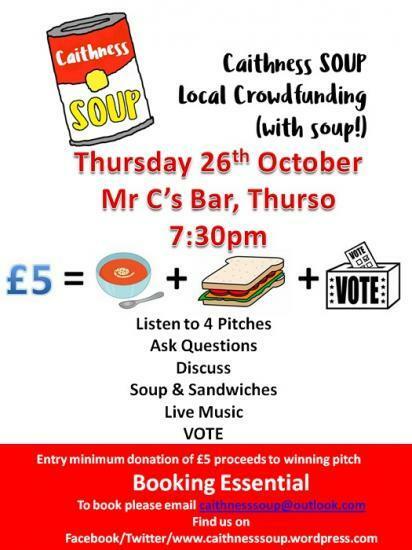 The idea is to provide an evening of food (SOUP) and entertainment for an entrance fee, groups will present their project, the audience vote on which they feel is the best and the winner takes home the proceeds of the evening to help them get going on their project. Winners come back at a later date to update on how they have got on. Simple. The idea behind SOUP which originated here at Detroit Soup is to not only give groups and individuals an opportunity to win some seed funding for their project but to also encourage community empowerment and involvement. The audience discuss the projects even if a particular project is not successful in winning SOUP everyone who pitches is in theory a winner as awareness of the project will have been gained and possible volunteers, customers or other people who can progress ideas could become involved due to the publicity and opportunity a pitch engages.